Format: The match will be played in the maximum of twelve games, the player who scores 6.5 or more will win the title. If the score is equal after twelve games the players will play the tie-break games. For more information on tie-break games, click here. Venue: The World Championship Match will be held in Sochi, Russia from 7 Nov to 28 Nov 2014. Time Control: 120 minutes for the first 40 moves, 60 minutes for the next 20 moves and then 15 minutes for the rest of the game with an increment of 30 seconds per move starting after move 61. Prize Fund: The prize fund of this match is 1 million Euros. The prize money will be divided 60 percent to the winner and 40 percent to the loser, if the match ends within 12 games. In case the winner is decided by tie-break games, the winner shall receive 55 percent and the loser 45 percent. Carlsen is the current World Champion in all the three formats in Chess - Classical, Rapid & Blitz. Currently ranked number one in the world, his peak rating was 2882, the highest so far achieved by any player. His playing style is very natural and he is often known to achieve attacking prospects and even victories in equal positions. He has a great positional understanding and can exploit even the slightest of advantages. Also one of his major strength is his endgame, wherein with his amazing skills he has turned many games. With all his youthful energy, confidence and of course the preparation, Magnus will give out the best he can in defending his title. Anand has won the World Chess Championship 5 times. He qualified to be the Challenger by winning the 2014 Candidates tournament which was held in Khanty-Mansiysk, Russia. His peak rating was 2814 and he has occupied the number one position in the rating list several times between 2007-2011. Anand is the recipient of six Chess Oscars. He has won the World Championship title in all three formats. Anand's playing style is versatile. One of his greatest strength is his speed, which helps him to calculate faster than most of the players. 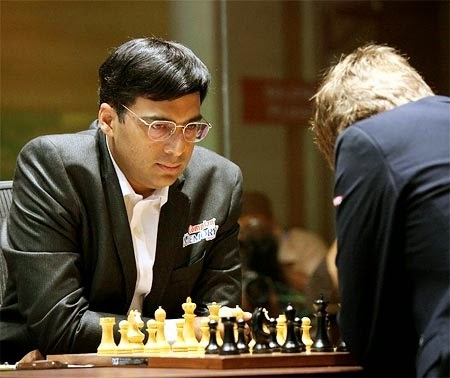 Also considered as one of the best players in terms of preparation, Anand can leave his opponents surprised over the board early in the game. With his experience, his spectacular comeback and of course his preparation, Anand will look forward to winning his sixth World Championship title. 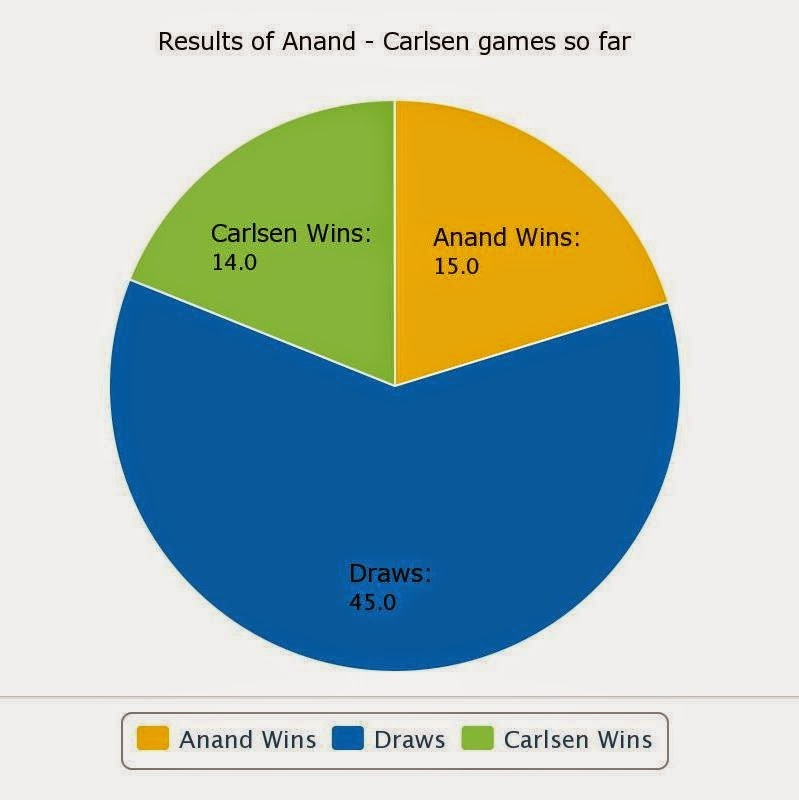 So far, Anand and Carlsen have met 74 times on the board in various time controls. The first game being played in 2005 and the most recent game was played in June 2014. First let us take a quick overview. 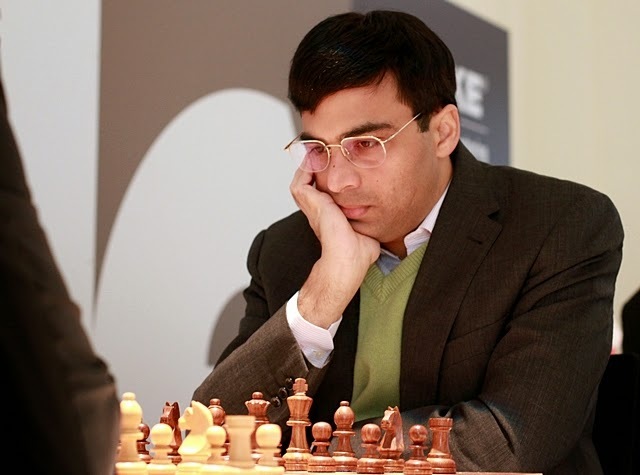 The overall results show that Anand is slightly ahead in terms of numbers, but it is also true that ten of his victories were achieved in the period of 2005-2008, when Magnus had not yet reached his true strength. Also we can see from the chart that the percentage of draws is quite high. World Championship Match 2013: The previous World Championship Match was held in Chennai, India from 9-22 Nov 2013. 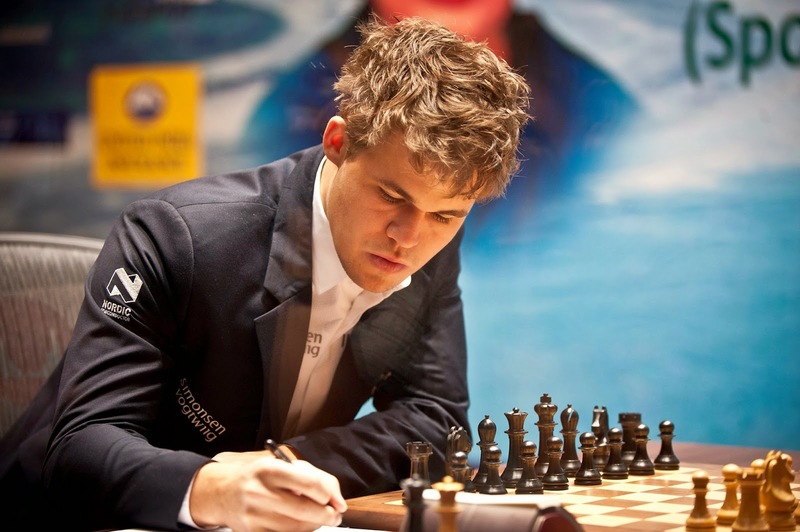 Carlsen dominated the Match from the beginning and went on to claim the world title with the score 6.5-3.5 in his favor. The most notable fact is that Carlsen won 3 games, drew seven and lost none. 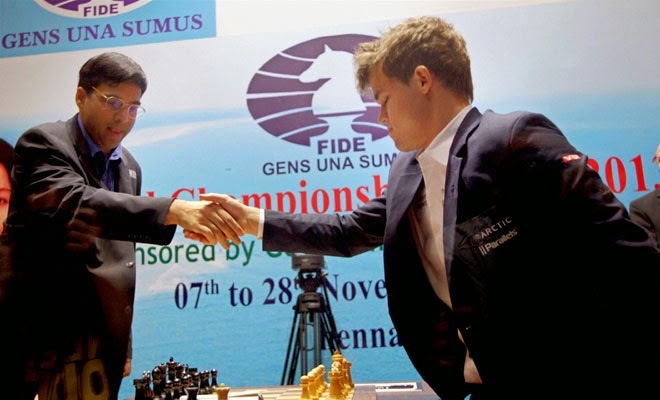 Post World Championship Match 2013: After the Match in Chennai, Anand and Carlsen have played five games. All the five games were played in this year, the results being 3 draws and one victory each. Anand has a great experience in Match format unlike Carlsen. It has been observed that he has been saving his preparation for this match by avoiding to play certain opening lines in other tournaments. This means he has great opening weapons at his disposal. A lot was being said against Anand's play after the last World Championship Match, but he made an amazing comeback and silenced his critics. Winning the strong Candidates tournament with a round to spare was just remarkable. It is as if he has become stronger than before. Anand will try to get something from the opening in every game. He will also like the idea of taking the match into tie-breaks, if possible. 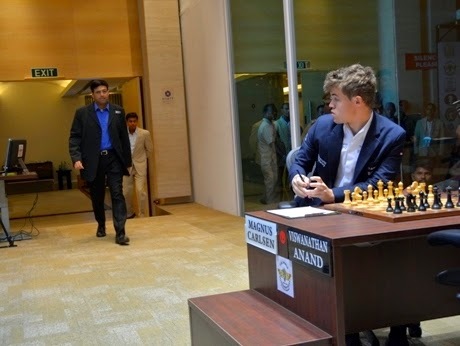 And the fact that Carlsen is not playing his best chess this year, will definitely add into Anand's favor. Anand has started working with his team many months before the actual match, and I am sure now that the time has actually come, he is looking forward to the games. Games that will change the course of history. Carlsen will start the match with a small psychological advantage, the memories of the previous World Championship Match. Carlsen's strategy worked very well last time, so he will try to repeat it. First, try to avoid getting in Anand's opening preparations. He will try to exploit even the smallest advantage and keep playing. Carlsen would also like to take the game into endgame, his favorite territory and get the point there. Also Magnus will not entertain the idea of short draws. If the age factor exists in Chess, it is in Carlsen's favor. He is energetic and willing to play aggressive and take risks. Also his fitness level is very high which would give him more endurance, if the game goes on for long hours. Carlsen is entering the match as a better player on paper. He is the favorite to win the title, and he would definitely want to prove with his game, why he is the number one player in the world. There are many ways to follow this match, but here I will give you my suggestions. To follow the match live with video streaming, you can visit the official website here. 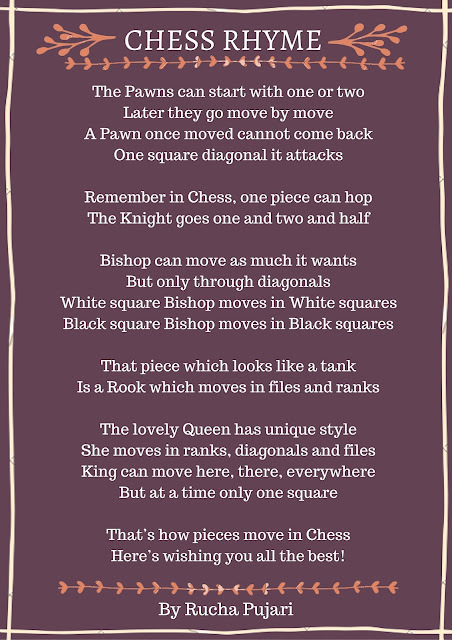 To keep yourself updated with news and articles regarding this match, you can visit Chessbase and ChessVibes. To follow the action easily on your Mobile phone, download the Android App - World Chess Championship 2014. Get the link here.